Ottawa Redblacks receiver Brad Sinopoli will miss the remainder of the year with a shoulder injury. 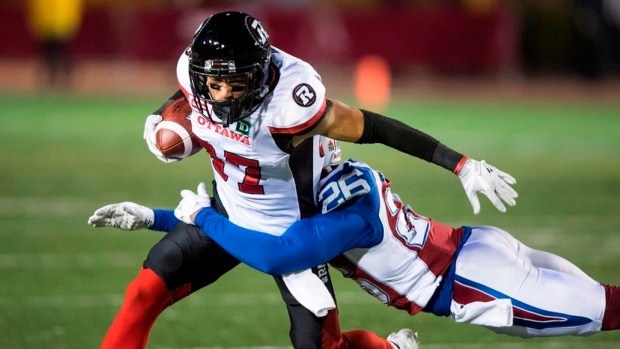 Redblacks head coach Rick Campbell announced the news on TSN Radio 1200 in Ottawa Monday and Sinopoli said his injury includes a broken bone in his shoulder that will require surgery. The 29-year-old Sinopoli had eclipsed the 1,000-yard mark in receiving for the third straight season with the Redblacks. Through 16 games this season, Sinopoli had 91 receptions for 1,009 yards and three touchdowns. The Redblacks are coming off a bye week and host the Hamilton Tiger-Cats Friday night, hoping to catch the Toronto Argonauts and win the East Division.